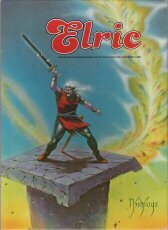 The world of Elric, written for the D20 rules. A very popular edition. Uses a much-evolved and modified version of Chaosium's Basic Role Playing rules set. 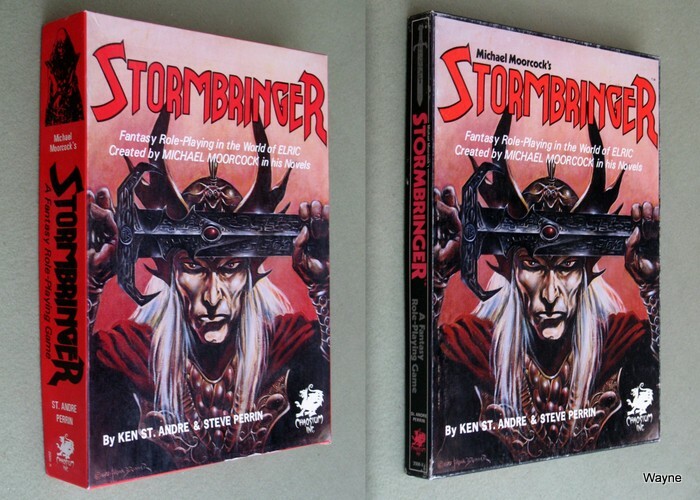 "Stormbringer is a roleplaying game bsed on the novels of Michael Moorcock, whose tales about Elric and other incarnations of the Eternal Champion are now classics of fantasy available everywhere in the English-speaking world. In this game, heroes discover secrets about the world of the Young Kingdoms, the nature of the universe, the Gods of Law and Chaos, and what their prophecies portend. You and your friends portray ordinary people from the Young Kingdoms who seek adventure, riches, power, and understanding. You face the same sorts of situations and dangers that Elric, Moonglum, Dorian Hawkmoon, and Corum encountered, but this time you must win those legendary victories. This book includes everything you need to tell heroic adventures just as experienced by Elric and Moonglum. First is an introduction to the world containing complete background on Melnibone, the once-dominant nation, and her former holdings — now called the Young Kingdoms. Character generation is quick and detailed (if you would like to meet your adventurer right away, turn to pages 52-53). The forces of Law, Chaos, and the Balance affect every adventurer — your Allegiance reflects the choices you have made during play. Rules for demon summonings and bindings, a cast-spells system, and invocations and enchantments fill the Magic Chapter. Demons, Monsters, Folk & Heroes describes the multitude of beasts, denizens, and human-like inhabitants of the world. Spot Rules highlight specific game details. The Gamemasters Chapter is recommended reading for new gamemasters. Two scenarios, six ready-to-play adventurers, adventurer sheet, NPC sheet, and Demon/Elemental sheets complete the book." Elric! replaced Stormbringer (4th ed). "This RPG has proved brilliant and entertaining for both novice role-player and experienced, for both those familiar with Moorecock's work and those who are not. I'll be the first to admit that the release of 3rd edition D&D has distracted me from this ingenious work of dark fantasy but before 3rd edition came out this system was the only one out of the many I have played in my 12 years of gaming to hold my attention (there are plenty of new rules that cropped up in 3rd edition that look familiar to ones in this book). The system of incresing abilities and skills is much better than the much acclaimed 3rd edition D&D. This game is also a much more "realistic" RPG than anything that TSR or Palladium ever put out. The fact that characters do not gain levels but instead increase their various skill and ablities by practicing them is a BIG step towards working realism in RPGs. There are none of the class restrictions found in other RPGs in this game. You can do what you learn how to do. And for those of us tired of explaining why our worlds are not controlled by the blatantly more powerful elven and dwarven races, this games' human-only content is quite refreshing. There is of course the non-human race known as the Melniboneans but they are little more (functionally speaking) than an eldritch and sorcerous race of decadent humans. My only complaints are that the book is paperback and that more people don't realize it's brilliance. Combat is extremely well laid out with an unsurpassed balance of realism, utility, and entertainment. 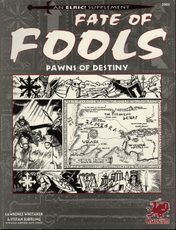 Even if you do not plan to run the campaign this book is FULL of great ideas applicable to any RPG from personal character quirk lists to a great and novel system of allegiance to the forces of law and chaos. Just beware of those brutal critical hit tables! oof!" ...from Amazon reviewer "Bryant Roque"
"Melnibone is an island, an archipelago set amidst the oldest ocean. For 10,000 years the bright empire of Melnibone ruled the world. The folk of Melnibone are not human, and their race is far older than humanity. Powerful sorcerers, their magic comes easily to them, as easy as breathing. They forged unthinkable pacts with demon gods, shaped the elements and lands to their liking, and tamed dragons and rode them to conquest. Age has dulled the bright empire, tarnished its beauty, and weakened its people. The empire rots from within. Soon a new emperor will come to the Ruby Throne, and rescue Melnibone from its dotage. Elric is that emperor, a brooding albino unhappy with his pre-ordained life. He rails against the gods of chaos, his culture, and his proud ancestors. Will he bring the bright empire back to its former glory, or send it to its extinction?" "Two ELRIC! Adventures -- Strange apparitions haunt the city of Raschil. An unusual source commissions the adventurers to stop the phenomenon. They journey to the famous university of Casandria and there attempt to gain possession of a Melnibonean Relic. Only the Book of Brilliant Things can staunch the flow of mysterious events and aid a friend in need. A lovesick young nobleman finances a search across Ilmiora, the Sighing Desert, an the Weeping Waste in search of his true love. They must quest for a magical Lute, and ancient Hymn, and a Troubadour with no equal to restore a love lost. This traveling adventure makes a good introduction to the northern realms. Maps included in this book portray a portion of the Northern Continent, and summary plan of the University of Casandria, details of the library, and city maps of Ilmar on the Pale Sea, Raschil, and Casandria. There are also many new illustrations and statistics, several new spells, and other source materials." "SORCERERS STRIVE TO UNDERSTAND THE UNIVERSE THROUGH UNHOLY PACTS WITH THE LORDS AND DEMONS OF CHAOS. NOW THEIR AMBITION GROWS. THE POWERS OF THE DAMNED. THEY SPEAK WITH THE DEAD, CALLING FORTH ROTTED CADAVERS TO DO THEIR BIDDING AND TO DIVULGE SECRETS FROM BEYOND THE GRAVE. NOW THESE SORCERERS SEARCH THROUGH ANCIENT TOMES FOR YET GREATER POWER, DISCOVERING NEW DEMON BREEDS AND NEW INFERNAL POWERS WITH WHICH TO IMBUE THEM. FOOLS! THEY WILL BE THE END OF ALL." "Great Imperial Melniboné lay swollen across the world. Her fingers wound through the planes of the multiverse a hundred times. Among the earthly slaves of the great Melniboné were grunting ape-men who ploughed and harvested the fields and vineyards. When the ape-men changed, they challenged their betters, and won against them. New kingdoms were gathered, this time by human hands. The Atlas of the Young Kingdoms: The Northern Continent discusses the Sighing Desert, the Weeping Waste, heavenly Tanelorn, horrible Nadsokor (the kingdom of beggars), the ancient evil of Org, and the Forest of Troos, free-trading and progressive Ilmiora, and the Lawful hell of dying Vilmir. We learn the origin of the Young Kingdoms and the great rebellion of Vil Valario, the ways of the people, histories, products, and attitudes, customs and holidays, provinces and towns, and important leaders. There are plot ideas and story seeds, scores of illustrations, full-page national and regional maps, city plans, a Lormyrian and a Melnibonéan calendar, and an index." 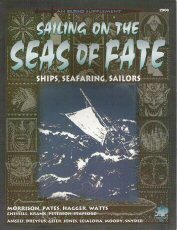 "Sailing on the Seas of Fate details ship and sea rules for use with the ELRIC! roleplaying game, providing all the tools and background needed by a gamemaster. It includes a ship record sheet, sixteen types of merchant vessels, various small boats, lethal warships, and the feared Melnibonean battle barge, Also featured are sailing instructions, a ship disaster table, sea menaces, storms, siege engines, seafaring, survival at sea, ship and sea battles in tire Saga, crew stats for five classes of vessels, creatures, scenario Hooks, an analysis of the Dark Ship that sails the multiverse, spot rules for shipboard combat, shipboard fumble rules, many illustrations, more." "Twenty-thousand years ago Grome and Straasha waged a mighty war. Continents, oceans, islands and seas were created. Twelve-thousand years ago a strange people settled an island, changed the world, and in the process changed themselves. Melniboné and her chaos patrons warred against the Menastrai, supporters of the balance, and a bloody fight ensued. Ancient sorceries allowed the Menestrai to flee their Melnibonéan pursuers, and escape to unmapped eastern lands. There they built beautiful kingdoms, each based upon the principles of balance. For a thousand years they prospered until found by Melniboné once again." 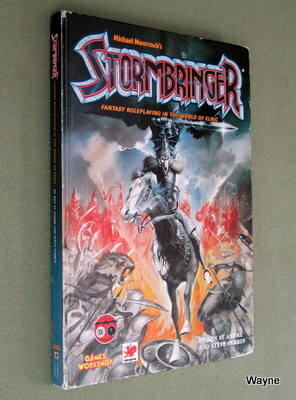 Stormbringer (4th ed) replaced the 3rd edition. I have a spotlight on the printings, and missing map & color plates at the Sales Site blog. This edition (in the 1990 printings) contains some nice pieces of color art in the center, by Frank Brunner In the Forest of Troos, Death of Cymoril, Elric the White Wolf), Nick Smith (Chaos Warlord, Pyaray), Keith Berdak (Demon Damsel), and Mark Roland (Cymbaline). 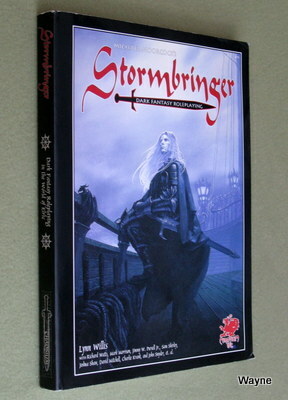 "STORMBRINGER is a roleplaying game based on a series of novels written by British writer Michael Moorcock. 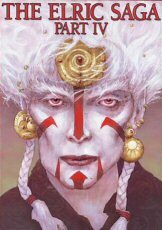 In these tales he describes Elric, the albino Prince of an empire that ruled the Young Kingdoms for 10,000 years but has settled, into a long decline. Now new nations are on the rise in the Young Kingdoms, new heroes have come to the fore, and new stories wait to be told. This book includes everything you need to tell such 'heroic adventures: an introduction to the Young Kingdoms (the world of Elric); instructions and examples for character creation; how to run a STORMBRINGER game session; complete background information about the inhabitants and nations of the Young Kingdoms including dozens of earthly creatures and creatures of chaos (plus methods of creating your own creatures); game statistics for the major characters described in Moorcock's tales including Elric of Melnibone and Stormbringer, his powerful runesword; religions in the Young Kingdoms; many adventures ready to play. "This book is a complete RPG game published by Chaosium, detailing the world of Michael Moorcock's Elric saga. The players usually take the roles of human explorers in the Young Kingdoms, although other race information is provided. The Elemental Gods (so frequently invoked by Elric) are described and a system for magic spells is also given. 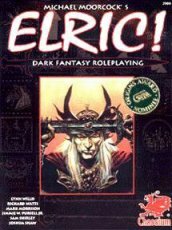 The game was revised and republished under the title Elric! some years later, however many people I know consider Stormbringer a better work. Like other Chaosium-produced games (Ringworld, Elfquest, Runequest, and Call of Cthulhu) skills are done on a d100 system and stats usually range from 2d6 to 3d6+6, depending on racial packages. Thus, if you know one game, it is pretty easy to pick up another. Of course, there are some minor differences from system to system, so it is not a truly universal RP system. I did like this game and would recommend it to any Moorcock, Chaosium, or fantasy fan." ...from Amazon reviewer "Derek Petrey"
"The multiverse is a complex system of intertwined universes, each unique, with peculiar physical laws, varying influences of the gods of Law and Chaos, and differing in the degree to which the use of magic and technology are effective. Heroes of sufficient cunning and ability traverse the physical barriers between these universes by means of special devices, spells, or magical portals. Risking their very existence, such heroes reap the reward of fabulous magical knowledge or exotic technological weaponry. 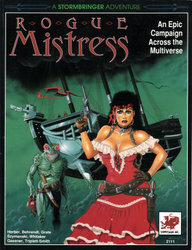 The Rogue Mistress is a vessel able to navigate among these million universes — a pirate ship of ancient origin, captained by the beautiful Maria de Tres Pistolas who leads an exotic free-booting crew gathered from across the Million Spheres. The adventurers encounter the Rogue Mistress as the result of a foul trap laid by Pollidemia, an immensely powerful sorceress. Using monstrous demon allies, she forces the adventurers to do her bidding in a manner so fiendish that she ensures their loyalty and cooperation. If successful, she promises to make them whole once again. ROGUE MISTRESS presents a high-powered, dangerous campaign for either the Storm-bringer or Hawkmoon roleplaying games. ROGUE MISTRESS features eight chapters, comprehensive listings of new weapons, additional races from which new adventurers can be created, plentiful illustrations1, plans, and diagrams, and new rules and clarifications for the Stormbringer roleplaying game." 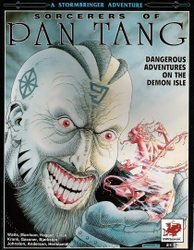 "Pan Tang is a grim island of lurking evil. Wild jungles to the north resound to the roar of a thousand tigers — the animal sacred to Chardhros the Reaper. The Plain of Glass divides the island, a shining wasteland of ancient volcanic catastrophe. The farmland to the south is a living hell to the slaves who work the great plantations. The capital of Pan Tang is Hwamgaarl, the City of Screaming Statues. Tigers walk among men and feed when they please. Sorcerers study dark knowledge and summon awesome horrors from other planes to do their bidding. The citizens of Hwamgaarl take their pleasure in the Gardens of Pain, gather their knowledge at the University of Lucid Perversity, and propitiate the Lords of Chaos at the Palace-Temple of the Theocrat. Jagreen Lern is the Theocrat of Pan Tang, presiding over this nightmare land. A new age is coming, and his armies are ready. Other nations of the Young Kingdoms already plot against Melnibone, and soon those plots bring war. Pan Tang hovers, vulture-like, awaiting the results of the first violent clash of Young Kingdom armies against the remaining might of Melnibone. Though Melnibone has ruled the world for 10,000 years, in only a small fraction of that time will it be destroyed." 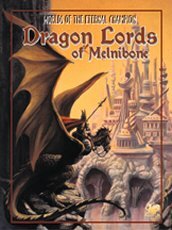 "A thousand years ago a great war between the Dharzi and Melnibone' eliminated the ancient race of sorcerers from the Young Kingdoms, and established the Dragon Lords as masters of the world. Far to the north of Melnibone', the family of a lesser lord took the caverns of a tall, black island as their home, transforming the former laboratory of a Dharzi sorcerer into a magnificent abode. Then, the Bright Empire began its inexorable decline, and the caverns were abandoned. Four hundred and fifty years have past, and something dark and vile now inhabits this isle, warping the natural order of living things and twisting their very beings into hideous monsters. Lord Straasha summons the adventurers to the coast of Tarkesh, bordering the frigid Pale Sea and the unholy domain of forbidden Pan Tang. Visions of bloody waves ceaselessly haunt their dreams, presaging a doom to come should the heroes fail to heed Straasha's urgent call. 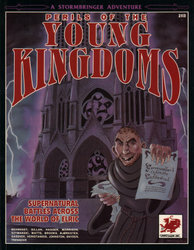 PERILS OF THE YOUNG KINGDOMS provides five independent adventures for the STORMBRINGER roleplaying game. 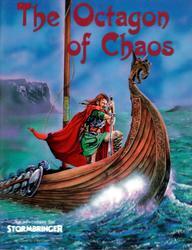 Each of these adventures explores places scattered across the world of the Young Kingdoms, revealing marvelous, mysterious, and treacherous locales such as the Floating Realm, a sargasso sea of ruined ships; the Link Machine, an engine of law which slowly mutates the winged Myrrhyn race; and a Chaos Storm, carrying the chaos pack of Queen Xiombarg, which hastens the appearance of the Infinite Cathedral of Gormweller the God Seller." "Between the Oldest Ocean and the Eastern Ocean lies the Isle of Purple Towns, the center of commerce and trade in the Young Kingdoms. Sailing into port, visitors are impressed with the magnificent buildings, the splendid markets, and friendly people. Few see the undercurrents, the dirty deals, and the politics which threaten to rip apart the apparent serenity of the island. The Isle of Purple Towns is a haven for adventurers, a safe port to count money and plan future deeds of daring. It lies literally in the middle of the world, and ships sail from Purple Towns ports to every other nation. It can form an excellent foundation for your ST0RMBRINGER roleplaying campaign. 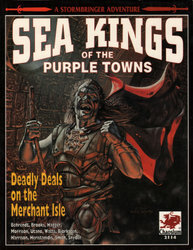 SEA KINGS OF THE PURPLE TOWNS provides adventures and background for the STORMBRINGER roleplaying system. It features four scenarios, information on the island of the Purple Towns and its inhabitants, instructions for creating characters from the Purple Towns, and intriguing illustrations and maps." "Available for the first time in a hardback book, and including the separately published Stormbringer Companion, Stormbringer brings alive the lands of the Young Kingdoms. 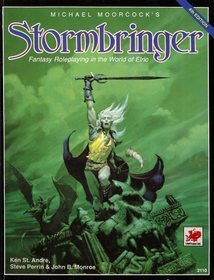 Based on the same game system as the enormously popular RuneQuest Fantasy Roleplaying Adventure game, Stormbringer allows players to choose from a wide variety of backgrounds, from Melnibonean Noble to Pan Tangian sorcerer. All the characters and places from the Elric mythos are here, ready for your characters to meet and adventure with. 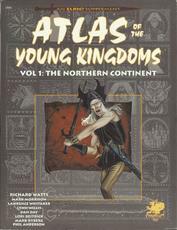 Complete details of the Young Kingdoms at the time of Elric are included, along with creatures, characters and 7 complete roleplaying adventures, including two solos. With this one volume, you have a complete guide to roleplaying in the world of Elric, Moonglum, Rackhir, Yyrkoon - and, of course, the soul-stealing demon-sword Stormbringer." 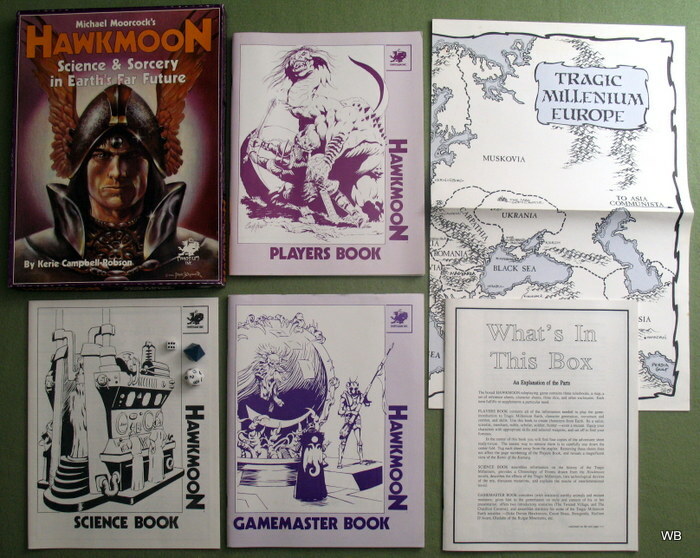 * Had the "thick, deep" box characteristic of early Chaosium box sets. * Map is red/rust color. * Went to the "thin, shallow" box style. Rulebook has errata printed on the inside cover. * Still has 2006-X product code. * Map is red/rust, with pink shading. * Went to 2101-X product code, otherwise contents, box the same as the 2nd print. Winter '84/Spring '85 Catalog has 1984 Chaosium releases. No ISBN on box. * Have also seen this box with the B&W, non-glossy map found in later printings. Catalog is a single sheet of blue paper. Recent and Coming Soon products indicate an early 1985 printing date. Curiously enough, the Stormbringer set in the catalog is the later printing, with the 3 separate rulebooks, unlike the single rulebook of this set. 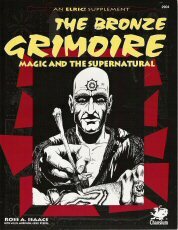 * I believe Chaosium considered this to be the 2nd edition (need to verify). * The single perfect-bound rulebook of prior sets was replaced with 3 staplebound booklets: Players Book (64 pages), Magic Book (36 pages), and Gamemaster Book (28 pages). Map of the Young Kingdoms is now simple black-and-white, printed on non-glossy paper. What's In This Box list states a copyright of 1985 and now includes the reference sheets. ISBN (0933635001) printed on box reverse; box art essentially the same. * twenty-five character & creature silhouettes." A later printing appears around 1985, with no significant difference except the addition of an ISBN on the cover. 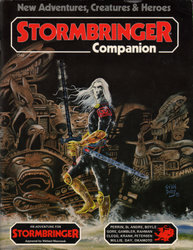 "Stormbringer is a roleplaying game of action and adventure in the Young Kingdoms, the world created by noted author Michael Moorcock in his ELRIC novels. This is the first supplement produced specifically for Stormbringer. Within this book you will find two main sections: Additions and Scenarios. The Additions section contains creatures, heroes (or antagonists), and exotic treasures for use by the Game Master in Stormbringer adventures. The Scenarios section contains six far-ranging adventures ready for immediate play. The adventurers will travel the world over: starting from daunting Forest of Troos, through the Dragon Sea, into the Marshes of Mist, over the northern hills of Shazaar, and onto the Plane of Shadows. They must meet and master every foe imaginable, but the rewards are well-worthwhile for the few lucky survivors." "DEMON MAGIC is the second companion for Stormbringer, the roleplaying game of action and adventure in the Young Kingdoms. • The Velvet Circle: a scenario in seven chapters, which takes many sessions of play to conclude. The adventure includes a complete red-light district, with business notes and a plan of the Circle. • Sorcerer's Isle: a shorter, more intense scenario to fill one or two evenings. • Runes of Rathdor: analyzes and describes the properties of six magical runes discovered during the reign of the 42nd Emperor of Melnibone. • Sanity for Stormbringer: introduces the optional characteristic of SAN into Young Kingdoms play. • Six new creatures, six nationalities, seven new Demon abilities, and five new magic items." 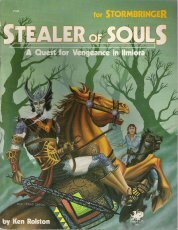 "STEALER OF SOULS is a scenario book for use with the STORMBRINGER game. The scenarios depict a woman's quest for revenge against a deadly conspiracy of merchants in Bakshaan. The four merchants (rivals of the woman's father, a man named Haver Nikorn) hired Elric to storm his keep and kill him. That battle is chronicled in the Moorcock story entitled "Stealer of Souls". Freyda Nikorn, the dead merchant's daughter gathers together a group of adventurers and friends to embark on her mission of vengeance. The adventures in this book tell the tale of Freyda's vengeance against the four merchants, and her success or failure is determined by the players. The gamemaster is provided with extensive information on the government, culture, and environment of Bakshaan. A complete description of a Bakshaan-Karlaak trade caravan is also included. Extensive character descriptions aid the gamemaster in storytelling. Four pages of player pullouts provide the players with all the information they need to start playing the scenarios. The pullouts include player-character knowledge of Bakshaan, a map of the city, and statistics for Freyda Nikorn." 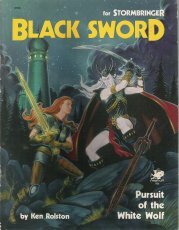 "BLACK SWORD is a scenario book for use with the STORMBRINGER game. The scenarios depict a woman's quest for revenge against Elric himself. Elric was hired by three merchants of Bakshaan (rivals of the woman's father, a man named Haver Nikorn) to storm the Nikorn keep and kill her father. That battle is chronicled in the Moorcock story entitled "Stealer of Souls". Freyda Nikorn, the dead merchant's daughter gathers together a group of adventurers and friends to embark on her mission of vengeance. 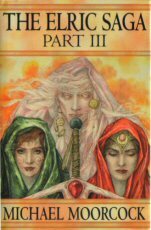 The adventures in this book tell the tale of Freyda's quest for vengeance against Elric and of Freyda's final battle with the White Wolf. Her success or failure is determined by the players. Freyda's quest takes her across the land of llmiora to observe the breadth of the destruction which always follows in Elric's wake. Elric's adventures during this period are chronicled in the book 'The Bane of the Black Sword'. The gamemaster is provided with extensive information on the governments, cultures, and environments of the various lands which Freyda must visit while following Elric's trail, including Nadsokor, Org, and Karlaak of the Jade Towers. Non-player-character descriptions aid the gamemaster in storytelling. The companion to this volume, called STEALER OF SOULS tells of Freyda's revenge against the conspiracy of merchants who slew her father, and of their plots against Freyda herself." • Complete information, stats, and maps for three powerful temples of the Young Kingdoms. DARKSPIRE: Temple of Chaos is a mysterious and sinister place, with many dooms for the unwary adventurer. From this dark abode the twisted worshippers of Mabelrode, the Faceless God, bring fear to all who fail to bow down to the power of Chaos! The Temple of the Eternal Flame lurks in the fiery heart of an ancient volcano. This remarkable temple is dedicated to the worship of Kakatal, Lord of the Fire Elementals. The mighty fortress of HAVEN: Temple of Law stands defiant against the minions of Chaos, and offers refuge to all who flee their wrath. Its courageous guardians worship four great Lawful dieties: Donblas, Goldar, Arkyn, and Callandus. They stand ready to battle Chaos whenever called upon by the faithful. • Escape From Yellow Hell, a high-level, ultra-magical scenario that will challenge even the most powerful adventurers. The adventurers must rescue a priest trapped in the Yellow Hell, a x5 Chaotic plane of the damned ruled by Zhortra, Lord of Chaos. 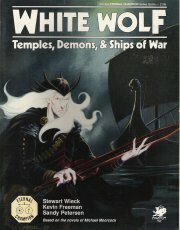 • WHITE WOLF also contains naval rules for the Eternal Champion series, suitable for any campaign, and new data on Elric of Melnibone (the "White Wolf"). Any adventurer created for an Eternal Champion game will function without flaw in any scenario in the series. The strength of Law or Chaos on a plane may affect a character's magical ability." "In the time of Sadric the LXXXVI, the Bright Expire was experiencing a time of peace belying the decadence and retrogression that has gripped the empire. Imperial garrisons in the far-flung Southern Kingdoms are brought home to Imrryr, the dreaming city, their need apparently past. Upon this vacuum the greedy theocrat of Pan Tang cast a crafty eye. He was not known to waste his time on trifles. In another place, a faceless Duke of Chaos contemplated the coming slaughter. 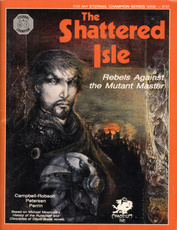 This volume is designed specifically for use with Stormbringer, Chaosium, Inc.'s fantasy roleplaying game set in the world of the young kingdoms, as written by Michael Moorcock. Illustrations, diagrams and a pull out map are provided to help the gamemaster vividly portray the events of this epoch." Players Book, Gamemaster Book, Science Book, Reference Sheets, Poster Map of Tragic Millennium Europe. Some sets have a Fall/Winter 1986 Chaosium catalog. "The Eternal Champion is a mystical hero who lives upon all planes of existence, in all ages and times. Whenever the greatest need arises, the Eternal Champion awakens to ensure mankind's survival. His names are many: Elric, Corum, Erekose, Urlik, Hawkmoon, and a multitude of others. Into the thick of the fray he strides, heroic companions at his side. Dorian Hawkmoon, Duke of Koln, is an incarnation of the Eternal Champion and the sworn enemy of the foul Granbretan empire. His homeland was ravaged, his people were murdered, and the twisted scientists of Granbretan sought to enslave Duke Dorian's mind - thus the Jewel in the Skull. Hawkmoon is an easily-played game of fantasy roleplaying, part of the Eternal Champion line of roleplaying games available from Chaosium. The game players create imaginary characters who adventure together through a vision of Earth as it might be, where magic is real and heroes exist..."
"The Shattered Isle is a supplement for the Eternal Champion series of Roleplaying games. 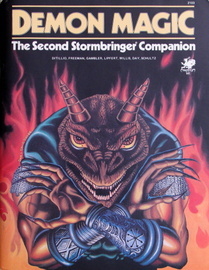 This series, currently consisting of the games Stormbringer and Hawkmoon, is based on the fantasy novels written by noted author Michael Moorcock. This book contains two sections: Additions and Scenarios. ADDITIONS: Contains new rules which are later used in the Scenarios. Included here are guidelines for vehicular and aerial combat and exotic and powerful weapons found in the New Fenian armory, more than 50 Beast Orders from the isle of Granbretan, and a glimpse into the daily routine of Oshol Nariva -- a typical member of the Order of the Boar. SCENARIOS: Contains numerous adventures set on the Tragic Millennium Earth. An extensive section titled Getting Here presents to the gamemaster capsulized methods for getting the adventurers involved with the Shattered Isle scenarios, including a variety of options for both Young Kingdoms and Tragic Millenium Earth adventurers." "The balance between Chaos and Law has tipped. Barbarian hordes sweep across the land while civilization decays in doomed castles. Eldritch beasts terrorize the innocent. Arcane technologies are all but lost and foul Chaotic magic corrupts land and sea alike. In the age to come a cursed Prince will seek his destiny across this dying world. His path will be vengeance, his ultimate goal ... to confront the gods themselves. What deeds will herald his coming? What heroes will prepare his way? In this supplement for the acclaimed role-playing game Stormbringer you can adventure in an heroic fantasy setting based on the World of the Five Planes created by the master of fantasy, Michael Moorcock. You will confront the most bizarre monsters and foil the deadliest plots on this and other planes of the Multiverse as you battle to free yourself and your world from the machinations of the gods. Adventure as a Vadhagh - aristocratic and solitary; or as one of their one-time rivals, the Nhadragh - now overwhelmed by the extinction of their civilization; or as a Mabden human faced with choice - to serve the barbaric forces of Chaos or the Lawful ideals of the waning elder races; or as one of the Shalafen who dwell in Coral Castles in the midst of the ocean; or a representative of the timorous, dissembling Ragha-da-Kheta of Khoolocrah. Players of Elric! and Stormbringer can even continue to use their established characters in this new milieu. 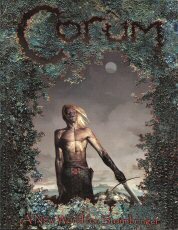 In addition to the geography and history of this unique fantasy world, Corum contains detailed overviews of its major peoples, creatures and customs. Special rules are provided for chariots, for Sorcery, Contriving and other arcane arts, and for creating other planes of the Multiverse. Included are three scenarios which convey the distinctive flavor of Corum’s world, and many exclusive maps. This book has been written as a supplement for Chaosium Inc.’s 5th edition of the Stormbringer roleplaying game, and is completely compatible with its previous edition, called Elric!." * 10 colored cardstock cutout sheets, with factions & play pieces. "Elric is an easy-to-learn and play game of world conflict. Players manipulate the armies and personalities of the nations of the Young Kingdoms in an attempt to conquer a world. Mighty spells, ancient artifacts, giant Battle Barges, and fearsome dragons must be met and overcome in addition to the massive armies behind them. 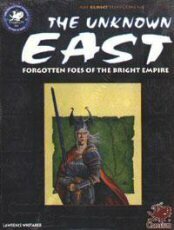 The wars of Elric are set in the Young Kingdoms, created by Michael Moorcock in his Elric stories. The player's prize? The gleaming city of Imrryr, ancient capital of the Golden Empire which ruled the world for over 10,000 years. Behind its massive, five-p or tailed seawall, Imrryr sits nearly impregnable. Only one person knows the secret of its entrance, Elric. However, control of Elric is delicate, at best. At exactly the wrong moments his famed, magical, demon-sword Stormbringer wrests control from its Chaos-worshipping master and slays his few friends. Beware also Mournblade, brother to Stormbringer and just as powerful, fickle and deadly. Scenarios in Elric take you from the foundations of the Golden Empire through the later struggles between a waning Imrryr with its imitation-rival Pan Tang. Behind all of the struggles sways and tips the Cosmic Balance, universal measure of the strengths of Law and Chaos in the world. Players must carefully gauge the effect of their magics upon the Balance, for a tip too far toward one or the other heralds the end of the world - either stagnating in perfect order or strangling on eternal change. This box provides you with all of the rules and pieces to participate in this epic struggle." "For millenia, the eldritch race of Melnibone has dominated and ruled the world. Since first the Gods forced them into the world, they have wielded dominion with their bloody might and mystic power. Now, with the inexorable passage of time, Melnibone's grasp is the soft touch of the forgetful elder. Now is the time for the Young Kingdoms. In the dotage of Melnibone, they must rise and assert their dominance over the realms of creation . With vigor and skill, they must bring fire and sword to the fabled halls of Melnibone, sleeping behind the five-portalled Dragon Gate that is their sanctuary. But this arcane gate is not faced lightly. Only Elric, King and Prince of Melnibone, fated Kinslayer and wielder of the dark blade Storm-bringer can solve its mystery. To assure victory, Melnibone must fall. To take Melnibone, the unpredictable powers of Elric, Prince of the Royal Line of Melnibone, must be dared. 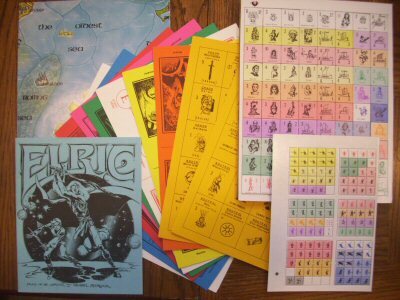 Elric is a fascinating challenge for one to four players. 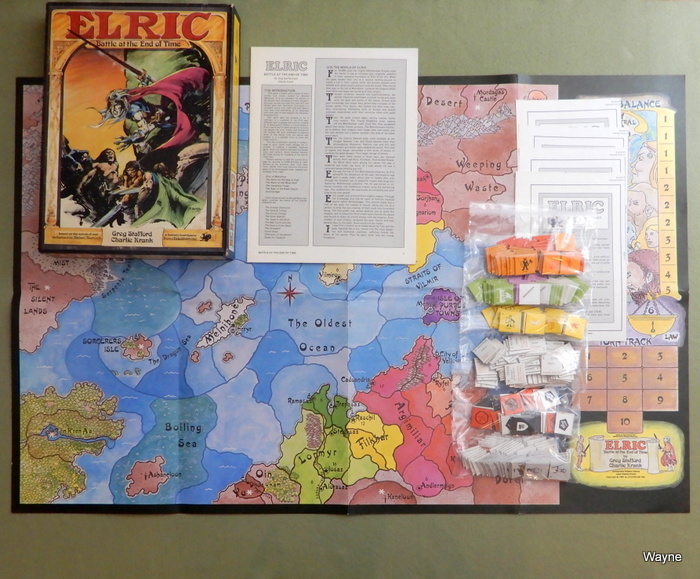 Each Player commands one or more Young Kingdoms in a desperate struggle to assert their mastery over the world of Elric. Each must search for the bloody ring of victory through war and through facing the mystic challenges of this hoaryland. In all-out conflict, they must carefully maintain the Balance or they will precipitate the end of all existence through the actions that they alone control. The Throne of Dominion stands vacant. You are challenged, nay dared, to march forth, face eternity and conquer all that stands before you. To the victor falls rightful claim to the powers and dominion of Melnibone, to the vanquished, only foul slavery and death can be expected. 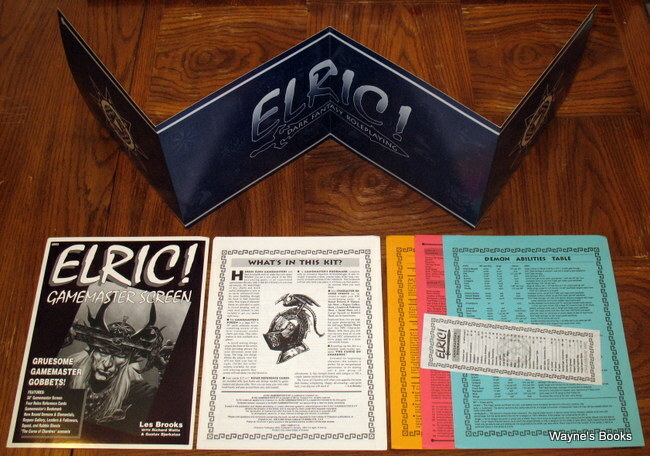 Elric is based on the classic works of Michael Moorcock, who authorized the creation of this game. Avalon Hill is proud to present this exciting saga as a game for all to enjoy." 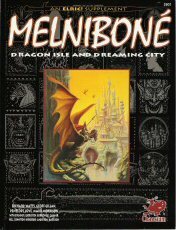 "For ten thousand years Melnibone ruled the world. Elric, the 428th Emperor, seemed destined to see that era come to an end. An albino, sustained by rare drugs, it fell to him to confront the rise of the Young Kingdoms, of the monsters and sorceries which were threatening to overwhelm him and his ancient crown. The Elric novels have already become classics of heroic fantasy and future projection. DAW is proud to present them to an eager public in new editions, corrected and revised by Michael Moorcock. ELRIC OF MELNIBONE is the first." "Elric of Melnibone, last of the emperors of a once mighty land, self-exiled bearer of the sword of power called Stormbringer, found a ship waiting for him on the misty seacoast of an alien land. 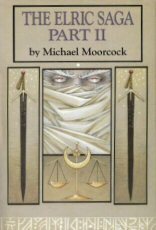 THE SAILOR ON THE SEAS OF FATE is the latest book of Michael Moorcock's far-famed Elric saga, published in paperback for the first time in North America. Though the second in sequence in the saga, it requires no knowledge of the other volumes to read this first, if such is your lot. Because Elric is one of the eternal champions — and all his books stand on their own. In the field of heroic fantasy, Moorcock is the acknowledged master... and DAW provides the gateway today for his myriad followers." "We must be bound to one another then. Bound by hell-forged chains and fate-haunted circumstance. Well, then — let it be thus so — and men will have cause to tremble and flee when they hear the names of Elric of Melnibone and Stormbringer, his sword. We are two of a kind — produced by an age which has deserted us. Let us give this age cause to hate us"
Imrryr, the dreaming city; Yyrkoon, the hated usurper; Cymoril, the beloved... all had fallen to the fury and unearthly power of the albino prince and his terrible sword. And Elric faced at last the fate that was to be his in this haunted era — that he must go forth, sword and man as one, and havoc and horror would be forever at his forefront until he found the Purpose that was yet obscured to him. 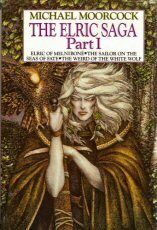 THE WEIRD OF THE WHITE WOLF is the authorized, revised and finally complete novel of the third book of Elric." "Elric of Melnibone, proud prince of ruins, last lord of a dying race, wanders the lands of the Young Kingdoms in search of the evil sorcerer Theleb K'aarna. His object is revenge. But to achieve this, he must first brave such horrors as... the Creatures of Chaos, the freezing wilderness of World's Edge, the gold-skinned Kelmain hordes, King Urish the Seven-fingered, the Burning God, the Sighing Desert, and the terrible stone-age men of Pio. THE VANISHING TOWER is the authorized, revised and final novel of the fourth book of Elric." "High in the wintry sky climbed the dragons as Elric urged his charges westwards. Thoughts of love, of peace, of vengeance even were lost in that reckless sweeping across the glowering skies which hung over that ancient Age of the Young Kingdoms. Elric, proud and disdainful in his knowledge that even his deficient blood was the blood of the Sorcerer Kings of Melnibone, became detached. He had no loyalties then, no friends, and if evil possessed him, then it was a pure brilliant evil, untainted by human drivings. High soared the dragons until below them was the heaving black mass, marring the landscape, the fear-driven horde of barbarians who, in their ignorance, had sought to conquer the lands beloved of Elric of Melnibone. "Ho, dragon brothers — loose your venom — burn, burn! And in your burning cleanse the world!" novel of Elric, complete in itself." "After five mighty books, the fabled saga of Elric and the sword Stormbringer reaches its terrific climax in this the sixth and final novel. Here, contained, is the last great strife of Elric in a world of barbaric forces, decadent powers, and champions of Doom. Here is the culmination of all adventures, the Ragnarok of Michael Moorcock's most famed epic. Yet, like all the Elric books, it can be read as a whole unit without reference to previous books. It is complete in itself. In fact, this is the first appearance of the full and original novel, authorized and revised by Michael Moorcock for DAW Books."